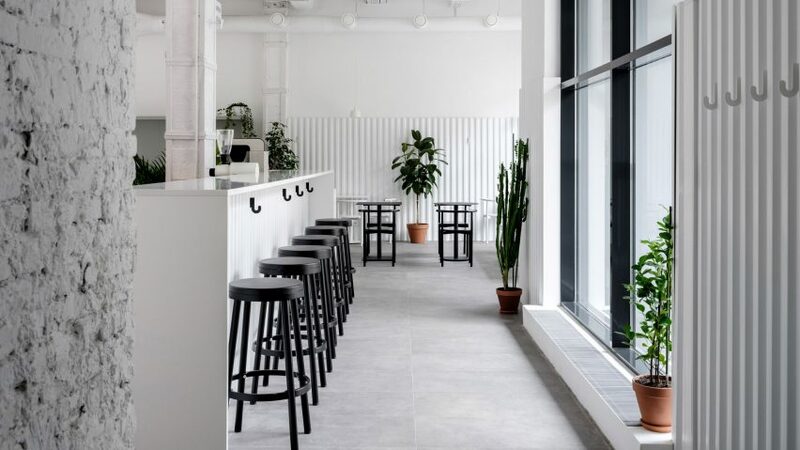 Russian studio Asketik has designed a cafe with bright white interiors in Moscow, offset with many indoor plants to soften the industrial space. 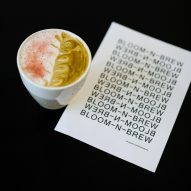 Bloom-n-Brew occupies a former Soviet silk factory overhauled by Asketik, which also led the branding design, including a new logo and menu with a type-based graphic. The cafe's name refers to the fragrant smell that is released when brewing a fresh cup of coffee. Defined by high ceilings and hardly any internal walls, the space measures 1,238 square feet (115 square metres) and is located in the Russian capital's Factoria Park neighbourhood. 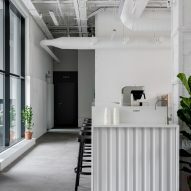 Areas for baristas and customers are arranged between various cabinets and exposed pillars, with large windows bringing light in. 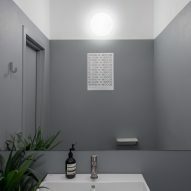 White walls, white ceilings, and light grey floors create a stark backdrop, amplified by exposed pipes that have also been painted white. "The inspiration was the history of the space," Asketik told Dezeen. "We wanted to save this industrial view and original purpose of the space." Softening the cafe are numerous indoor plants in terracotta pots, and different seating nooks. The lush foliage pops against the stark space. 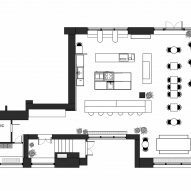 The square floor plan is organised around a central coffee area, with four counters that are wrapped in powder-coated profiled sheeting, commonly used for roofs and fences. A nook alongside the windows accommodates distinct, high wooden table designs. 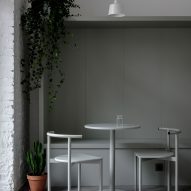 Another high-top area features a series of barstools, with simple hooks designed by Asketik. 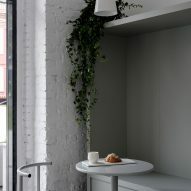 The studio was founded by designer Maxim Maximov, who started with one small object at a time to grow a full collection. Asketik's shelves are also used at Bloom-n-Brew, along with other pieces. Curved-back chairs and small round tables are included in white, black and light wood. Designed by Delo Design of Saint Petersburg, these pieces have an eclectic yet unified effect. 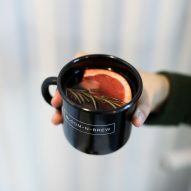 Also new to Moscow's food and drink scene are a shiny pink pastrami joint and a concrete-clad restaurant with a geometric exterior, both by Crosby Studios. Photography is by Mikhail Loskutov.